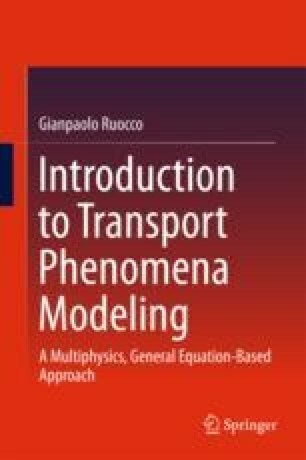 Many processes involve simultaneous transport phenomena in a variety of environments. The intertwined effects of gradients of temperature, velocity, and species concentration in the considered media are impossible to study by analytical methods and prohibitive to attack with experimental procedures. That is why numerical computations of such complex processes, or virtualization, come into play. Being the CFD our tool of choice to integrate the ensemble of governing PDEs, supplemented with proper PCB notations, one can enforce the virtualization of transfer phenomena to extract all of the information needed without recurring to systematic experimental assessment, provided that modeling has been properly validated with the corresponding data. In this last chapter, our attention is devoted to actual modeling: that is, the choice of proper governing Equations (with related initial and boundary conditions and ancillary statements, where applicable) that will be integrated and that will yield for all sort of graphical restitution of results.